Get self-service of passwords with HPE Service Anywhere – FREE Version! Service Desk Institute has just published a new report on corporate self-service of passwords. The report reveals significant difficulties for a majority of large companies when introducing self-service of passwords for end-users. At least 5 major problems cause users to reject self-service. This Webinar will highlight the results, and present the successful best practices from FastPassCorp, which enables customers to reach 75-90% adoption. The FastPassCloud solution can be delivered together with HPE Service Anywhere and Service Manager. 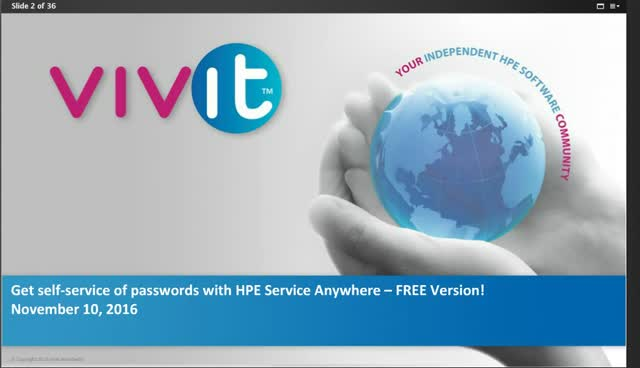 Title: Get self-service of passwords with HPE Service Anywhere – FREE Version!